Ryan Preece will replace A.J. Allmendinger behind the wheel of the No. 47 JTG-Daugherty Racing Chevrolet in the Monster Energy NASCAR Cup Series in 2019, the race team announced Friday at Charlotte Motor Speedway. Preece has been racing part-time in the NASCAR Xfinity Series this year. He has competed in nine of the 27 races, so far, in 2018 and is on the entry list to drive the No. 18 JGR Toyota Saturday in the Drive for the Cure 200 at Charlotte. Preece has one win this year, coming at Bristol (Tenn.) Motor Speedway in April. In 49-career starts in the Xfinity Series, Preece has two-career wins, eight top-fives and 11 top-10 finishes. Preece has made 155 starts on the Whelen Modified Tour since 2007, resulting in 22 wins. He was that series’ champion in 2016 and finished second in the standings three other years. Preece has five previous starts in the Cup Series, all in 2015, all coming in 2015. 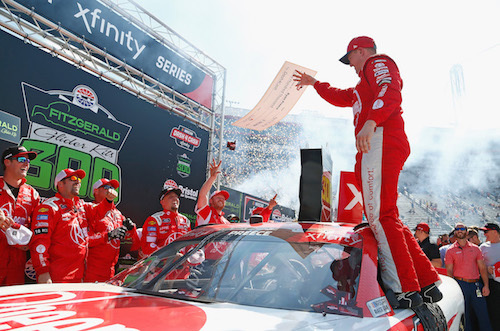 His best finish was a 32nd at New Hampshire Motor Speedway in Loudon. JTG-Daugherty announced Allmendinger’s release from the team earlier this week. Details of Allmendinger’s racing future remain unknown.